My interest in boomerangs can be traced back many years, when as a schoolboy. I tried to make one from a piece of bent hazel wood. The inspiration for my effort was derived from a school lesson which featured various weapons of Australian aborigines. I was so intrigued by accounts of the boomerang that I decided to try and make one for myself. Unfortunately, I had only an illustration of a boomerang to work from, which gave no indication of size and thickness, or the fact that it possessed a certain sectional shape. Furthermore, I didn't know how a boomerang was thrown. Consequently, my attempts to get a piece of bent hazelwood to fly and come back to me, were, to say the least, both disappointing and unsuccessful. So I gave up the idea of trying to make and throw a boomerang. The thought did cross my mind that perhaps boomerang throwing was an art and skill known only to the aborigines and perhaps there was something magical in the construction of a boomerang which made it return. Of course I had no aborigine playmates who could let me into the secrets of this *magical flying stick*, and there were no books available on the subject to which I could refer. So my interest in boomerangs died there, or so I thought. Then a few years ago, after spending best part of my early adult life as an enthusiastic archer, I set out to discover if I could the secrets of the boomerang and how to throw it. I then spent several months searchingfor information. For a start, I contacted friends with Australian connectionsand searched the libraries for books on the subject. I then wrote to theLibrarian at Australia House in London who kindly supplied me with an assortmentof photo copies of articles on the subject. Sifting through these I cameacross a great deal of useful information which included a short article(author Unknown) on how to throw a boomerang. Finally, I arranged a visitto the Ethnographical Department of the British Museum, where I was ableto view a selection of hunting weapons and boomerangs on display there.My visit was arranged with the Asst. Keeper of the Ethnographical Department, Mr. B.A.L. Cranstone, who in the meantime had kindly and thoughtfully selected from the Museum's Library several books which contained articles and drawings relating to boomerangs. Like the articles from Australia HouseLibrary, most of these were written during the latter part of the last century, but never-the-less contained useful information which I was able to note down and so increase my knowledge on the subject of boomerangs. My visit to the British Museum had proved most rewarding, for I now had a very good idea of the actual size, shape and thickness of the *Magic Stick*. So, armed with this precious information I set about making a replica in birch ply. My first model was rather large and crude, but never-the-less, you can imagine my excitement on dashing off to the local sports field to try it out. I threw it, and to my utter astonishment it actually *flew* and came back on my first attempt. I then spent several hours throwing, and was most reluctant to leave the field, only doing so when it became too dark and dangerous to continue. I have been making and throwing boomerangsever since. I have also taught dozens of others to do the same, and will no doubt go on doing so for the rest of my days. Such is the fascination of the boomerang for me. In the past so many contradictory articles have been published regarding the distance an aborigine could throw a returning boomerang, that the reader has the utmost difficulty in separating fact from fiction. The majority of these articles appeared in a variety of publications before the turn of the century, and were supposedly from eyewitness accounts by early explorers of Australia. It would appear from many reports that the observer was blessed with a vivid imagination and not adverse to a great deal of colourful exageration. One eye witness reports to have seen an aborigine throw his returning boomerang nearly 200 yards and then waited several minutes for its return \"whereupon it suddenly appeared and landed with a thud, burying itself deeply into the hard ground a few paces from the thrower.\" A highly dangerous practice, I would say. 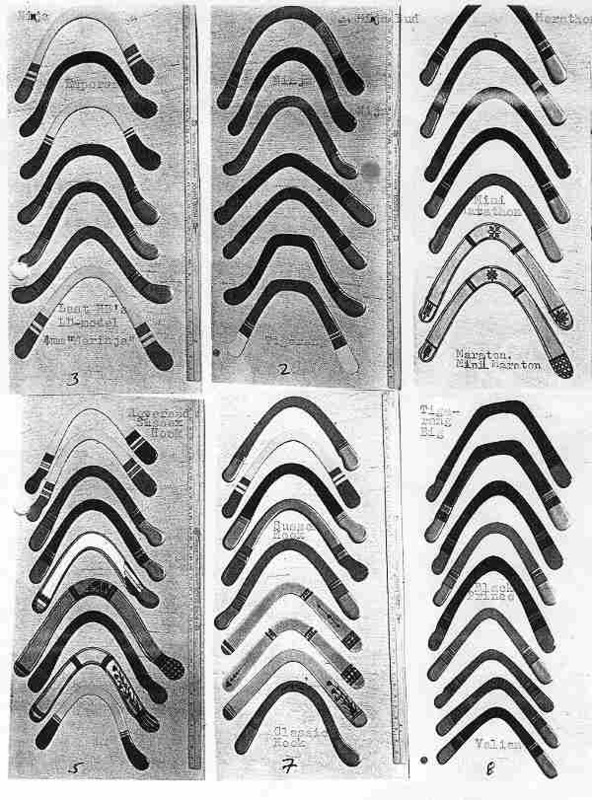 Others have attributed to the boomerang almost supernatural powers by stating to have seen them \"climb heavenwards to a height of several hundred feet and circle freely about the sky as if unwilling to return to earth\" and then, miraculously ... \"drop at the throwers feet.\" Now these accounts of a boomerang's performance in the hands of the aborigine would make exciting reading were they to be written for a school boy's comic or novel, but unfortunately, (with all due respects to the aborigine's skill) they are not altogether true. In the opinion of many other more serious enthusiasts of the boomerang who have spent years living amongst the aborigines and learning their culture and various skills, the more accurate and less romantic accounts of the returning boomerang's true performance, both in distance and flight duration, have recorded it as having an average outward range of 40 yards, with duration of flight averaging 10 seconds. From my own limited experience and observations, these latter figures are much more realistic. It is possible that some of the earlier observers have somehow confused the returning boomerangs performance with that of the non-returning hunting boomerangs which, I understand, couldbe thrown to greater distances by throwing them, as the aborigines did, across, and slightly down wind. If on the other hand, the writer was referring to the overall flight distance of the returning boomerang, as being nearly 200 yards (and not the distance it travelled outwards) then this would have been a very fair estimate for a boomerang, travelling as it does, on a near circular orbit, particularly if the boomerang in question had performed a series of \"pendulum swings\" or possibly, as some do, a second smaller circle, before returning to the thrower. However, this explanation doesn't answer the question of the long flight durations which one eyewitness recorded in minutes. Possibly, from the point of view of someone observing for the first time a boomerang in flight it would appear to be airborne for a long time, performing its various manoeuvres in the air, but this is only a \"mental time illusion\" and the observer would probably be surprised to learn that he had just witnessed a flight which could be timed in seconds only. Some of my own long distance boomerangs, which have a flight path of approximately 300 yards, have been consistantly timed in flight at only 10 - 12 seconds from the moment they leave the hand to the time they return back to the throwing mark. Almost all the boomerangs available commercially are of the type which have an outward range of between 15 and 35 yards. It is rare to find one that will exceed the latter distance by more than a dozen yards. These could be described as \"short distance models\" as also could the \"Gem\", \"Sycamore\" and \"Traditional\", which appear in Chapter2. There are many present day claims for long distance throws of up to 100 yards, but it would seem that the type of boomerang used was of a designand weight not available commercially, and furthermore, on closer investigation many of these 100 yard claims were for outward distance only with only partial return. With this fact in mind, I have included this final chapter for the benefit of the enthusiast who is interested in making long distance models, capable of reaching 100 yards or more and which will return completely back to the throwing mark. I have personally proved this by making a world record throw of 108 yards. This distance was achieved in the presence of official witnesses at the Littlehampton Sports Field in Sussex, on 17th June, 1972. Details and a flight plan of this record throw are shown on the inside back cover. The throw is also featured in the Guinness Book of Records. The boomerang used for this throw was a large birch ply \"Gem\" shaped model, ballasted with several small metal weights (a technique which I discovered after several months of experimental work, the details of which have never before been published). When I first started to make boomerangs a few years ago, using birch ply as a basic material, I had difficulty in reaching distances in excess of 40 yards. I did however, manage to improve this range by making much heavier models from alloy and fibre glass, but these were more difficult to shape and, furthermore, required a great deal of physical effort to throw successfully. I then hit upon the idea of ballasting my original birch ply models with small metal weights in an endeavour to increase their distance potential without appreciably increasing their overall weight in the hand. My initial experiments with ballast were carried out, by simply strapping thin discs of lead to the blades of the boomerang, by means of adhesive tape, moving the discs to various positions after each throw, and noting down their effect on the boomerang's flight. I was quite amazed after a short time, to discover that it only required a small amount of ballast, set at the right position on the blades, to improve the boomerangs outward range by over 50 per cent, without affecting its return ability. After more tests, and using heavier weights, I found the best possible position for ballasting, was at a point on the blades, approximately one inch from the tips and a small amount set at the \"elbow\" to give a more horizontal return. The amount of lead ballast which I used, depended on the original weight of the unballasted boomerang, but generally, an amount of ballast equal in total weight to a quarter of the weight of the boomerang was sufficient to more than double the boomerang's outward distance. The boomerang I used for my world record weighed six ounces before ballasting. To this I added just a fraction over two ounces of lead, which was divided into two equal amounts, and set permanently into the blade tips. To do this, I formed the lead into cylinder shaped plugs, each measuring 1/2 inch in diameter, drilled holes in both blade tips and then gently tapped the plugs into position until they were flush with the surface of the boomerang. This was a simple operation and is the method I now use to ballast most of my distance boomerangs. The question now arises: how much ballasts hould be added to a boomerang in order to gain the maximum distance, without affecting its return qualities ? The answer to this question is, to a certain extent, a matter of trial and error. Heavy boomerangs won't require as much ballast as lighter models of the same shape. However, as a simple guide, a weight of ballast equal to one third of the boomerang's original weight, should not be exceeded otherwise the boomerang will be \"overweight\" and will not return successfully, unless thrown in a very strong wind, which in any case will reduce its outward distance and thus defeat the object of ballasting in the first place. Furthermore, should you get the boomerang back, it will probably have climbed high in the air and return on a steep downward flight path, which is both dangerous and undesirable. Another question now comes to mind regarding the shape of boomerang best suited to ballasting, (some shapes are more successful than others). I have always found that the most successful results are achieved with ballasted models of the \"Gem\" and \"Sycamore\" and other boomerangs with parallel blades. I have never had a great deal of success with weighted versions of the \"Traditional\" shape. Perhaps there are aerodynamic reasons for this. However, like the aborigine, bless him, I am blissfully ignorant of the reasons a boomerang will perform in a certain way when changes are made to its balance, shape, section and size (of which there are dozens of combinations). Nevertheless, by trial and error, I have gained a useful working knowledge which has enabled meto make successful returning boomerangs in numerous shapes and sizes. Furthermore, I have also discovered a method of increasing a boomerang's range by weight ballasting and am more than pleased to be able to pass on this knowledge to other interested enthusiasts. I am also fully confident that the reader of this modest little book will not only be in a position to make and throw his own boomerangs successfully, but will no doubt be able to improve on my own humble achievements. Two chapters of this page are directly imported from Herbs book \"Boomerangs\". Ted Bailey made the task of scanning the book on his computer. If you want to obtain the whole book (which is certainly worth it, as it is out of print) get in contact with Ted. Check out the note as it contains important copyright information. This document is distributed with the permission of Mrs. Anim Smith, in memory of her departed husband Herb. This document can be freely distributed to others, provided this notice remains attached. This software cannot be sold or sections used in commercial ventures without the express consent of Mrs. Anim Smith. A small fee for shareware distribution is, however, permitted. To obtain permission for replication and distribution, you can call Mrs. Anim Smith at 0903 72372 1or write to her at: 15 Malin Road; Beaumont Park; Littlehampton; West Sussex BN17 6NN; United Kingdom.